Shooting with natural light can give natural-looking photos, but it's all too easy for 'natural' to end up appearing a little too raw, with harsh contrast creating burnt-out highlights, murky shadows, and an overall unflattering look for portraiture. One solution is to use your flashgun as a fill light. But your first, easiest, and likely cheapest option is to break out a collapsible reflector. These refreshingly simple pop-up panels simply bounce sunlight back onto your subject to illuminate what would otherwise be in shadow and create a more balanced exposure. Reflectors come in various sizes depending on the size of subject you want to illuminate, and you can even choose different reflector colors, should you want to add warmth to your reflected lighting. White: A white reflector surface is the default choice for reflecting light - it gives soft, neutral illumination for a natural look. Silver: Silver is the preferred option in duller conditions as it reflectors more light. Steer clear in sunlight though, as it’ll be too harsh. Gold: Go for gold when shooting at sunset to maintain a warm look. Use sparingly, as it’s easy to make your model look too bronzed. Black: A black ‘reflector’ doesn’t reflect at all - it simply shields (or flags) light from your sitter to create a more dramatic, contrasty feel. Diffuser: A multi-surface reflector will usually be based around a translucent diffuser panel - this is great for softening direct light. This diffuser can then converted into a reflector by adding a zip-on cover, with various surface colors available. Collapsible reflectors are so simple that, for occasional hobbyist use, it’s difficult to justify splashing out on a premium product over a budget model. Phottix’s keenly-priced EasyHold isn’t even completely lacking in frills, as it sports a pair of handles for easier positioning, and though these are far less chunky and ergonomic than those on the Lastolite and Profoto reflectors, they do the job. The panel itself is a diffuser to soften direct lighting. A double sided, reversible cover then gives you a traditional selection of gold, silver, white and black colour options. We’ve gone for the 107cm diameter panel as it gives maximum versatility without being too hard to handle, and still packs down to a convenient 36cm diameter. There’s also a 120cm EasyHold option if you’ll be working with groups, or the 80cm panel would work well at closer range. If you can do without the more subtle colours in the Lastolite 8-in-1 TriFlip kit, this Phottix is great value. Lastolite is credited with developing the very first pop-up circular reflector, and the TriFlip is a refinement of the original design. Large-diameter round panels can be unwieldy to handle, but this panel’s triangular shape makes it more manageable, while still maintaining plenty of surface area. A single handle is all it takes to maintain a good grip, and the handle is nice and chunky. This particular 8-in-1 kit is available in 45cm and 75cm sizes, with the latter being a more versatile size for portraiture. A larger 120cm Trigrip version is also available and is a better bet for full-length shots, but only comes in 2-in-1 variants. With eight surface options, the TriFlip is ready to create almost any lighting look. The bare panel is a 2-stop diffuser, but two reversible covers give a total of seven surface options, including: White, Silver, Softsilver (whiter silver), Gold, Sunlite (silvery gold), Sunfire (darker gold) and Black surfaces. Profoto is an aptly named company, as its reputation for uncompromising quality makes Profoto gear a hit with pros. There isn’t much you can do to make something as simple as a collapsible reflector stand out from the crowd, but profoto’s chunky, sculpted handles make even the Large (120cm) version comfortable to position. This size is best for full length or group photos. If you only plan to shoot head or three-quarter length shots of you sitter, the Medium (80cm) version is preferable. Several colour options are available, but only as double sided 2-in-1 reflectors - none have separate covers to add extra versatility. Your options are Silver/White, Sunsilver (light gold)/White, Gold/White, Black/White, and a translucent diffuser. If you only buy one, we’d go for the Sunsilver/White option, as the pale gold side adds some warmth to your sitter without producing an unflatteringly yellow reflection, as can happen with a conventional gold surface. 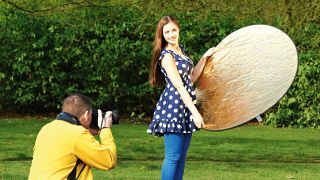 Where a standard pop-up reflector usually collapses down to around one third its open diameter, the HaloCompact packs into a carry case just 27 x 6.5 x 6.5cm and weighs a mere 335g, yet opens up to a very versatile 82cm diameter. The detachable fabric is available with silver/white reflector surfaces, or there’s a 2-stop diffuser version; these can be bought separately, so you only need buy one frame. The remarkable space-saving design is thanks to Lastolite’s RapidExoframe collapsible lightweight aluminium frame that quickly slots together like a tent pole. The fabric then simply clips to the frame. The collapsible frame features a handle that incorporates a ¼” thread to attach the panel to a tripod head. In reality, the 12 clips can be a little fiddly and stiff to attach, especially when tensioning the fabric with the last couple of clips. It gets easier with practice, but will never be as effortless as a conventional pop-up design. That said, most people will only open and collapse a reflector once during a shoot, so the extra set-up time is negligible. The innovative Omega features a removable cut-out so it can also be used as a shoot-through reflector. The ‘hole’ is in a 3:2 aspect ratio so it easier to keep out of frame when using an APS-C or full-frame camera. The idea is the reflected light behaves as though its come from a ring flash, giving you a softer, more even illumination that wraps around your model’s face. It’s a theory that does actually work, although it’s not exactly easy to get the effect. The panel is large at 114 x 96cm, and with a big square opening in the middle, it’s floppier than a standard reflector, so you’ll need a helpful long-armed assistant to hold it steady. The panel itself is a 1-stop diffuser, but can be clad in four colours: black, white, silver, and ‘sunlight’ light gold. Patch panels in these same colours - plus a diffuser version - are included to fill-in the central hole, turning the shoot-through Omega into a conventional reflector. Having handles on your reflector is certainly nice, but they’re by no means essential. Assuming you’re not shooting a gale, a basic round reflector is easy enough to hold and can manipulate light just as well as a premium panel. SRB’s disc may be the shoestring budget contender, but it’s still a generous 110cm diameter, while construction quality is hard to separate from reflectors costing two or three times the price. The core panel is typical of a 5-in-1 kit, being a translucent diffuser that takes the edge of harsh sunlight. A zip-on cover provides a typical quartet of surface colours: white, silver, gold, and a black side that's useful should you rather shield light from your model. We’d plump for this 110cm version as it’s big on versatility yet very light on your pocket. If you’d prefer a more handy size for reflecting light onto a face for headshots, but there are also cheaper 40cm and 80cm options available.